Chocolala Belga is a tiny artisanal Belgian chocolate maker and shop hidden in a small side street, right in the heart of Madrid – I was so happy when a friend steered me to it a few weeks ago! The street is worth visiting on its own right – this is the oldest part of Madrid and has meter-deep granite walls where you get a true feel of the past. Inside the shop you have a view into the workshop behind where all the chocolate magic happens! A little research has taught me that you cannot call your chocolate “Belgian” unless you make it in Belgium, (fair enough!). Paul-Hector Bossier, the owner and creator has cleverly sidestepped this problem – Chocolate has been re-baptized chocolala! 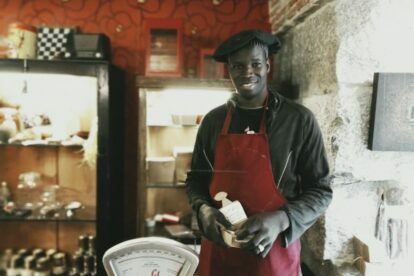 He makes his sweets with chocolate sourced in Belgium, and very delicious they are too. I like the truffles – there are lots of flavours; there is also hot chocolate, ice cream and chocolate bars. Another favourite of mine is the candied orange peel dipped in dark chocolate – bitter sweet, mmm! The chocolates are very well-priced for a hand-made product, so treat yourself!